IF XAVIER CAN DO IT, WHY CAN’T WE? Xavier is our angel. Although we lost his mother during his birth, God blessed us with Xavier. A pulmonary embolism caused his mother’s death and resulted in loss of blood flow to Xavier. 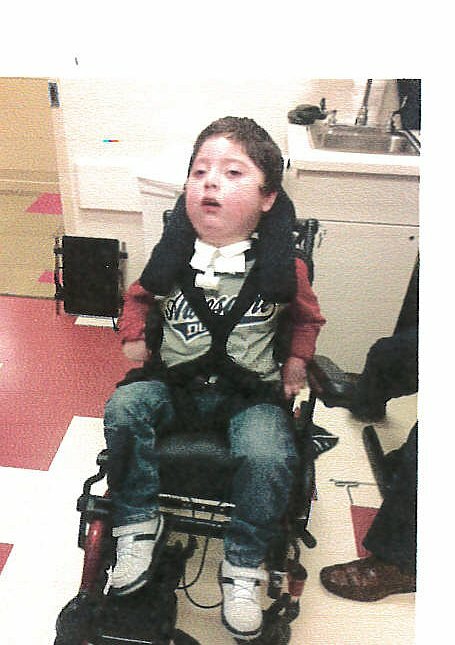 Because of severe brain damage, Xavier has a tracheostomy, cerebral palsy, epilepsy, and is fed by a G-tube. He cannot sit or stand independently. At birth he was given six months to live. We believe love has kept Xavier alive, just as his love keeps us going. Today, Xavier is healthy but dependent on us for all of his care. We are seeking financial help for home modifications and a van with a lift. Insurance provides for his medical needs, including equipment such as his wheelchair, stander, and hospital bed. But insurance will not help us install a stair elevator or meet his transportation needs. Xavier is a vital part of our family. He spends his days in the living room with our family. We take him with us to church, shopping and on family outings. But, he is a big boy, and it has become difficult to carry him up and down stairs and transfer him from his wheelchair to a car seat. That is why we are reaching out to you, to help us in whatever way you can, to allow Xavier to continue to be a part of our active, loving family. Family and friends of Xavier Rodriguez are raising money for the nonprofit Help Hope Live to fund uninsured medical expenses associated with Catastrophic Illness. Xavier’s family has chosen to fundraiser for Help Hope Live in part because Help Hope Live assures fiscal accountability of funds raised and tax deductibility for contributors. Contributors can be sure donations will be used to pay or reimburse medical and related expenses. To make a tax-deductible donation to this fundraising campaign, click on the Give button.